Sharon and Vezna visit at least two floors every time they’re at Forest Hill. Vezna also spends time with residents during exercise programs, where she will go from resident to resident, stopping for short visits. Vezna doesn’t have to do much to get residents’ attention. Sometimes residents simply want to pet her, scratch her or get her to shake a paw. “She is the perfect little therapy dog,” Sharon says of eight-year-old Vezna. “Some residents with dementia can become agitated, but after a visit (with Vezna), you can see what a calming effect she has on them,” he says. Sharon says her favourite aspect of being a Forest Hill volunteer is that it’s an opportunity to give back to the community. Her visits with Vezna also make a difference to people, evidenced by the smiles and laughter Vezna will draw from residents during her visits. And of course, Vezna brings back memories for many residents. 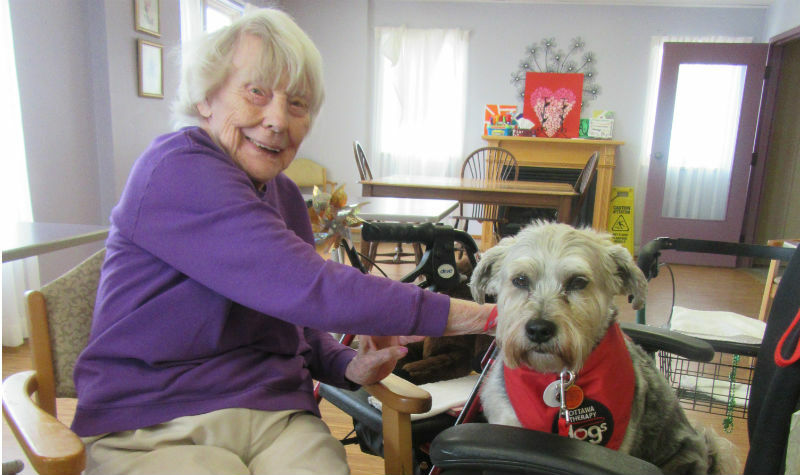 “A lot of them are used to having pets and can’t now, so the visits, no matter how brief, bring back a piece of happiness they had for so long,” Sharon says. Sharon recalls one telling moment when Forest Hill’s physician was visiting residents with an intern. They were in one resident’s room while Sharon and Vezna were visiting. “The doctor turned to the intern and said, ‘You see that? That dog will do more for these residents here today than any medication I could prescribe,’ ” she says.